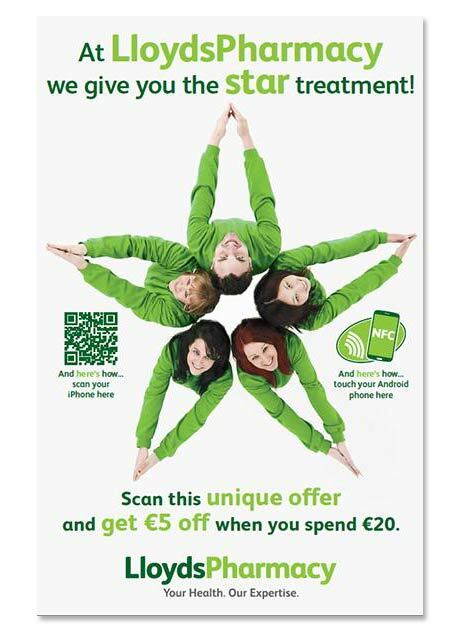 Lloyds Pharmacy Ireland has promoted its new branding with an advertising campaign that gives customers €5 off a €20 spend when they tap their phone to NFC posters placed in 80 bus shelters near 74 stores located around the country. Shoppers are taken to a web page which invites them to show it in store to redeem the offer. The campaign has been delivered for the pharmacy by marketing agency Mediaworks and out-of-home media provider PML and includes QR codes as well as NFC tags.